A friend, professor at De La Salle University (DLSU) Political Science Department, Prof. Eric Vincent Batalla, posted in his facebook wall last Friday this story: He gave me permission to blog his story, thanks Eric. Early Christmas Bonus to the Metro Manila Development Authority towing services. Yesterday morning, my son and I brought some stuff at the condo on Taft Avenue. In order not to obstruct traffic, I parked in front of 7-Eleven behind those parking obstruction poles attached to concrete slabs on the road. These are usually used by buildings so no one could park in front. Well, the car was towed five minutes after it was parked and while I was inside the building. So, fine. It was illegal parking after all this time and I was guilty (but the claim of obstruction? that was funny). The car was brought to the MMDA Ultra-1 Compound in Ortigas, which registered a trip of 17 kilometers for the towing company. The new MMDA regulation signed by Chairman Francis Tolentino says you pay towing services of P1,500 for the first four kilometers and P200 for each succeeding kilometer. 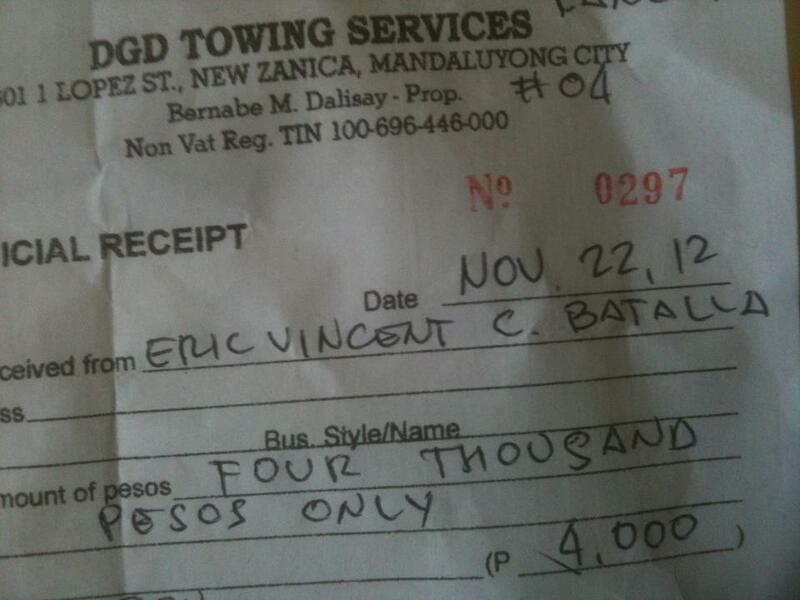 So I paid P4k to the towing company plus P500 to the MMDA for the violation. So I paid and went home yesterday feeling unlucky hahaha. But there are at least a couple of questions that are hard to answer. First, why was the car which was parked in Manila brought to a distant impounding center (and not in Manila where the offense was committed)? 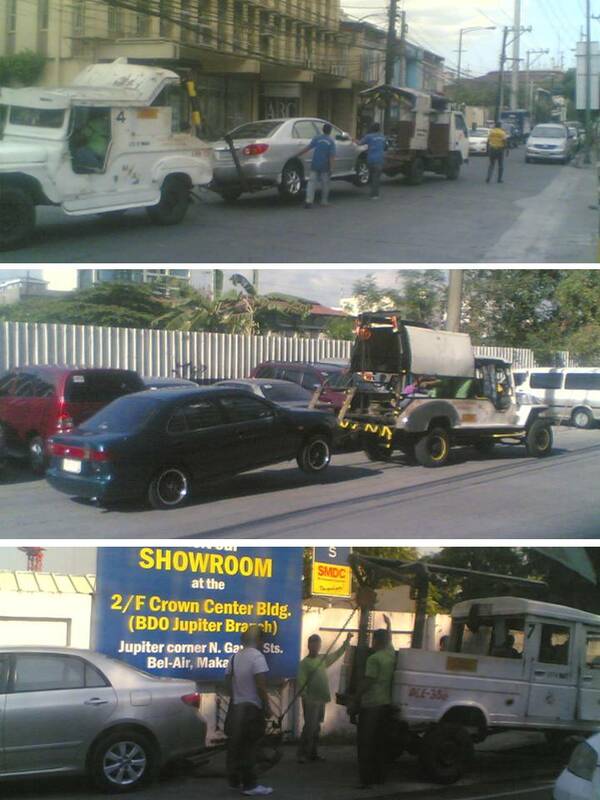 Second, why does the MMDA, which is supposed to coordinate with Metro LGUs, permit a private towing company to tow and make money out of distance charges by bringing the car to the Ultra-1 impounding Center and not to Manila's impounding center? It is truly the season of giving gifts. Don't get me wrong. I admire the new MMDA chair. However, does this suggest a loophole? I'll raise this issue to the MMDA. If this administration wants to govern well, it should pay attention to the everyday injustices. I did mind paying a fortune but it was a helpless situation. In the Philippines, the culture of impunity is strong. Ordinary people learn how to be helpless in the face of daily abuse. And they say it's more fun in the Philippines. They've got to put their act together hahaha. 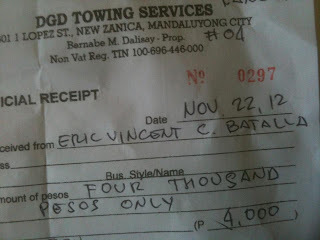 I really think that the car should have been impounded in the city of Manila, not in Ortigas where I had to pay more. One can easily speculate on the commissions to bureaucrats. I also commented in his wall, I said that he has another first-hand experience of the rule of men, not rule of law. And since they towed his car without a driver inside, the hand brake was not released and the car put in neutral gear, then that means brake pad or lining is already damaged, he will have to spend several thousand pesos more to replace it plus labor. And the Metropolitan Manila Development Authority (MMDA) will not admit accountability for that additional damage and costs. If one will move around, one can easily spot cars that are illegally parked, mostly jeepneys, tricycles, police and government cars (red plate), and armored vans. These vehicles are not towed, nor their drivers are penalized. If not the MMDA, other local government units (LGUs) like the respective city governments, have their own towing operations, aside from other regulations like the anti-smoke belching units (ASBUs) and their various racket. 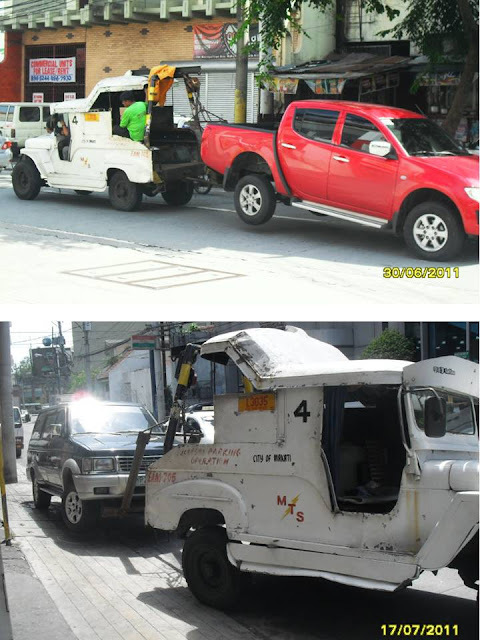 Here are photos of towed cars in Makati alone. Notice the car below, two towing vehicles carried it. We citizens pay various taxes for the salaries and perks of government personnel, then we pay more to them as they tow our cars even for flimsy reasons, as ASBUs apprehend diesel powered vehicles even if these are not smoke belchers, other ither forms of harassment and prohibitions. BIG government is all about parasitism, both national and local governments.